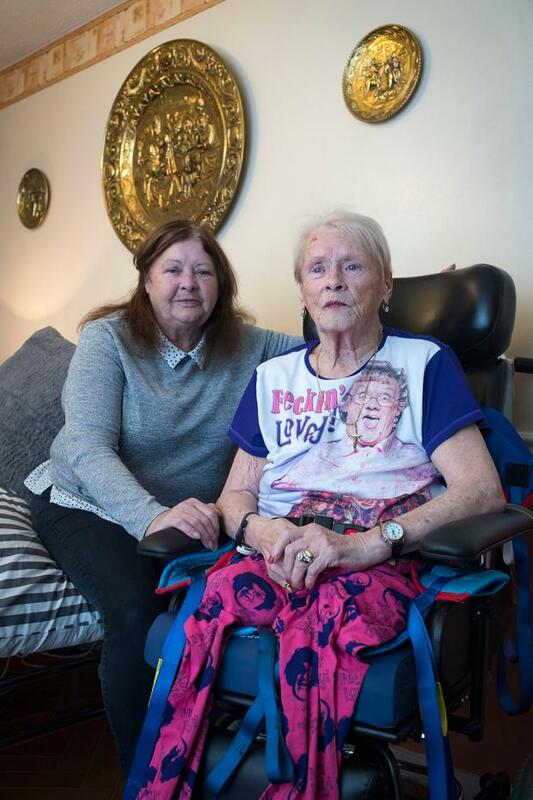 ‘It’s not fair’: Bernie O’Reilly (left )is battling to get sufficient care for her mother June, who recently lost both her legs to diabetes and is also blind. Photo: Arthur Carron. Full-time carer Bernie O'Reilly says she's at her "wits' end" trying to care for her aging mother, who is blind and a double-leg amputee. Since leaving St Vincent's Hospital last week, the HSE has provided 79-year-old Dublin-native June with just 30 minutes of homecare each day. Ms O'Reilly told RTÉ's 'Liveline' yesterday that the limited support her mother is receiving is an insult to a woman "who has worked all her life". "I've had no choice but to leave my husband and daughter so I can give my mum the care she needs and deserves in her own home," she told the Irish Independent. "This is a woman who has worked all her life and now, at a time when she needs help, it just isn't there. "I'm so distressed and worn out, but at the same time I refuse to put her into a nursing home, which is my mother's biggest fear." The 79-year-old spent six months in St Vincent's Hospital, where she had both her legs amputated due to diabetic-related complications. She is also registered as blind and a breast cancer survivor. Ms O'Reilly said it's not fair that the HSE is depending on family members to care for elderly people, without providing adequate support. "It's not fair that they're blaming elderly people for taking up hospital beds," she said. "My mother could have left hospital two months ago, but didn't as we couldn't secure proper homecare for her. "But having said that she was looked after extremely well in St Vincent's and the doctors and nurses did everything they could despite their limited resources. "I think it's a national disgrace that so many elderly people are being ignored by the State. The Government needs to do so much more and treat OAPs with respect. "They say the economy is improving and that everyone is benefiting, but it's definitely not being felt with regards to home carers. "I don't know what's going to happen with my mum now because I really can't look after her, with just 30 minutes of help each day." Ms O'Reilly said that the two carers that come into her home each day do a "fantastic job". "They're great and they get along so well with mum," she said. "They even feel like it's a shame that they can only spend 30 minutes with her, knowing full well that it's not enough. "June has had three falls since she moved back home and, to be honest, it terrified me. "Thankfully, I managed to get her up and she wasn't hurt, but I'm afraid she's going to seriously injure herself if she doesn't get the care she needs," she said.